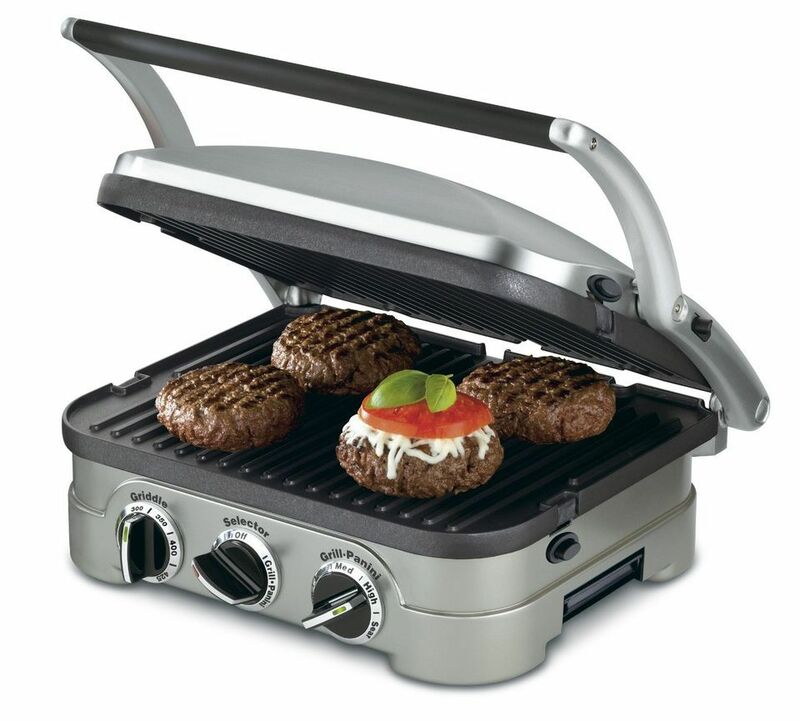 The Cuisinart Griddler is a multi-use machine. The grill plates are reversible, with a flat cooking surface on one side and a ridged cooking surface on the reverse side, so you can use it as either a panini press or a contact grill. But that’s not the end of its versatility. The hinge adjusts for thicker or thinner foods, and it also opens completely so the cooking surfaces are flat, perfect for cooking pancakes or any foods where you want to avoid any chance of steaming. You can also use the Griddler with a flat surface on one side and a ridged surface on the other, so you can cook eggs on the griddle and sausages on the grill. The center dial can be set for grill cooking, griddle cooking, or to turn the machine off. The griddle knob lets you set specific temperatures while the grill/panini dial has low, medium, high, and sear settings. The plates are removable and dishwasher-safe for easy cleaning. Optional waffle plates are available for purchase, so you can also make Belgian waffles with this appliance. One complaint about contact grills is that it can be hard to tell when the food is done. Either you keep opening the grill to check the doneness, or you set a timer and cross your fingers. The T-fal OptiGrill is designed to take some of that guesswork out of the equation with sensor technology that tells you when the food is cooked to perfection. You simply choose the type of food you’re grilling (burger, poultry, sandwich, sausage, red meat, or fish) and let the grill do the work. There is also a setting for cooking frozen food as well as a manual option for cooking your food without letting the grill call the shots. Cleanup is easy, since the grill plates are removable and dishwasher-safe. There are two models with the same funtions, with one that makes four servings and a larger one that makes eight servings. If you want to keep costs down, this round grill can handle your burgers, chops, steaks, and vegetables easily. There’s only one cooking surface, so this doesn’t work as a contact grill, but there’s a glass lid if you want to speed up cooking, do some steaming, or keep foods a warm for serving. The power cord is removable, so you can take the whole grill to the table for serving, and the grill plate is removable for cleaning. The heat settings are adjustable for cooking different foods. The plastic knob on the lid can be a little fragile and the grill itself is not as sturdy as those at higher price points. When you need a large surface to grill, fry, or broil some food, a large grill pan is a wise investment. Keeping a large grill pan around can make home cooking much easier when you need to prepare a lot of cooked food in a single setting. The Lodge LPGI3 Cast Iron Grill is the best product to choose for this purpose since it gives you two different cooking surfaces for the price of one. Coming in at 20 inches by 10.44 inches, the rectangular grill pan has enough space for large slabs of meat or several small cuts to cook at once. The reversible design features a grilling surface on one side and a griddle surface on the other. Combined, the pan is great for searing, frying, grilling, broiling, and other high heat applications. Due to the heavy cast iron, however, it may not be suitable for some glass stove tops. If storage space is at a premium and you don’t need to cover two burners at once, a single-burner grill pan can be a very good investment. While you can’t grill both sides at once like you can in an electric sandwich press, you can use the pan on the stove or in the oven, and it’s even safe under the broiler. At 9 1/4 inches square, this is big enough to cook four average burgers at the same time, finish a thick steak in the oven, or use for oven-roasting small chickens or roasts. The pan has a porcelain enameled interior that doesn’t need to be seasoned, while the cast iron retains heat to give food the grill marks that look so good. The handle is nice and wide, so it’s easy to hang onto, even when wearing thick oven mitts. This is dishwasher safe, but is easy to clean by hand – just let it cool first. If you want a grill that can be used indoors or out, this handy grill stands on its own tall feet, so you can use it outdoors (as long as you can plug it in) while you enjoy fresh air and sunshine, even on your wooden balcony where open flames might be forbidden. Or move it indoors when the weather doesn’t cooperate. The cooking plates are removable and reversible, so you can cook on a ridged surface, or a flat one. The plates are nonstick and dishwasher safe for easy cleaning. An integrated drip tray catches the mess as you cook. The domed lid has a stay-cool handle so you can check the food without grabbing an oven mitt first, and the temperature is adjustable from 200 to 400 degrees. This has a large, 180-square inch cooking surface that’s great for family meals, but probably not sufficient for a backyard party for the neighborhood. This handy sandwich press can grill sandwiches of any thickness, and the floating lid means that you be able to press evenly, so ingredients won’t slide out as you smash. This will make a thin and tasty grilled cheese sandwich, properly smash a Cuban sandwich, or make sure your submarine sandwich has a crisp crust. The cooking surface measures 12 x 8 1/2 inches, so there’s plenty of space for two hearty sandwiches, and it has a nonstick coating for easy cleaning, but you can’t remove the plates for cleaning. A light indicates when power is on and the grill is preheated. The press locks closed, so you can tuck it away easily in either an upright or horizontal position. It also locks open, so you can make open-faced sandwiches or heat tortillas. There is nothing quite like the taste of a sandwich made from a true sandwich press. From paninis to grill cheese sandwiches, the warmth and texture of a pressed sandwich tastes like something much more expensive than the individual ingredients you put on it. To get this high-quality taste, you need the right tool for the job: a great sandwich or panini press. The Hamilton Beach Gourmet Sandwich Maker is a standout in the company’s already impressive line of sandwich/panini presses. Due to its unique, cafe-style floating lid design, the press can apply heat and pressure evenly across both sides of the sandwich regardless of the thickness. The press can also be used for grilling other things like pizza and bruschetta. 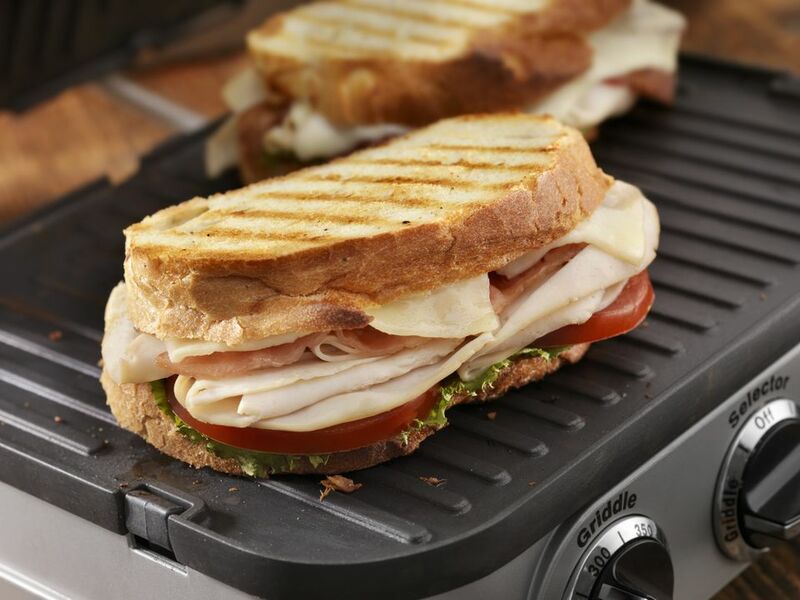 Folding up for easy storage, this is one press to bust out anytime you want a real grilled sandwich.